Ice cream frozen in a spherical mould and covered with chocolate, Bombe Glacee is a French dessert simply called Bombe in England. This pudding looks like a cannonball hence called as a bomb. This ice cream appeared on the menus of restaurants in France as early as 1882 and is nowadays available all over the world. It is extremely easy to whip up at home and can make for a great after party dessert. 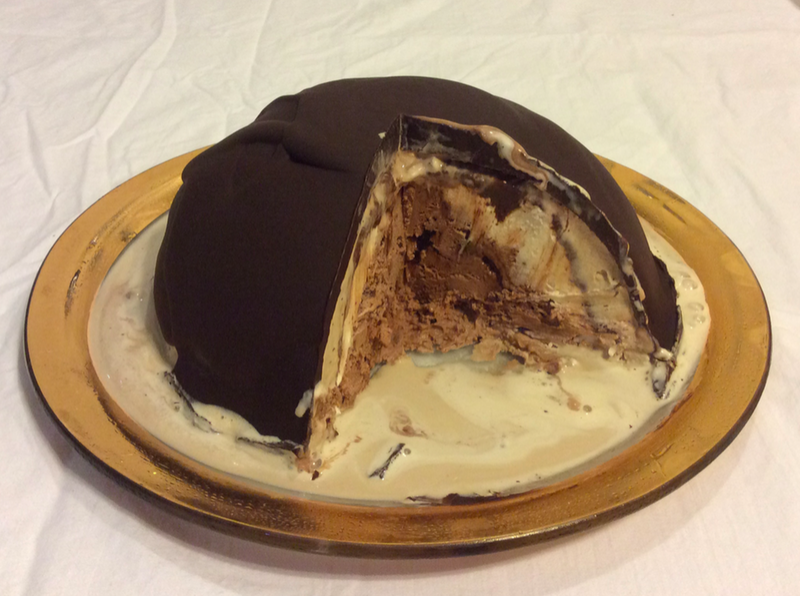 You can even surprise your kid with a Bombe Glacee as an ice cream birthday cake. Prepare a pudding bowl by lining it with a plastic wrap hanging enough outside of bowl so as to wrap the prepared dessert properly. Cut the fruitcake loaf into thin slices and spread it around the lining inside the bowl (cover the entire base and walls). Reserve a few cake slices to top the ice cream. Pour chocolate syrup all over the fruit cake slices to be soaked in well. Scoop out the ice cream with spoon or ice cream scooper and place in the bowl over soaked sponge cake to fill the bowl nicely until top. Flatten the surface by pressing with the back of the spoon and arrange rest of reserved fruit cake slices on top to cover the upper surface completely. Tip: You may use homemade or readymade ice cream. Gather the hanging plastic sheet from all sides and fold it over the fruitcake covering in the bowl. Place a plate or tray over it to press gently to even the surface and then refrigerate for at least 2 hours. Melt the chocolate pieces in a double boiler or in microwave just before bringing ice cream out of freezer. Unwrap the bowl from top and unmould the frozen ice cream on a serving platter by inverting it. Remove the plastic sheet and pour the melted chocolate over fruit cake layer to run all over the ball. Serve immediately or freeze it again to set the chocolate layer and then serve. Tip: You may add any fresh or candied fruits or nuts of your choice in the ice cream before spreading it inside the bowl. You may use any syrup for soaking the fruit cake.